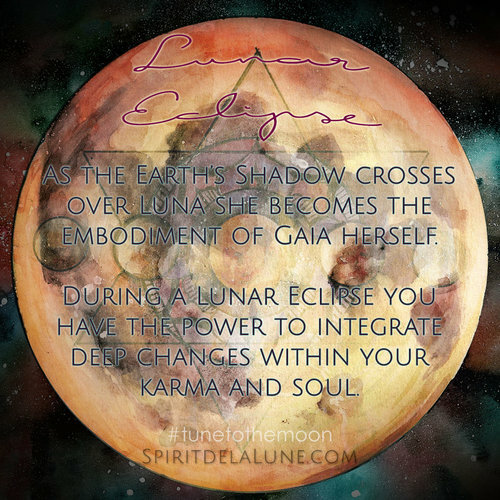 This Full Moon & Lunar Eclipse in Leo is packed full of powerful magical potential! Tonight's Full Moon gives you the chance to step fully into your powerful magic. Six months ago you planted a seed or held a vision of your future. Today is the day to check in and see how far you have come. Lunar eclipses occur every six months, giving us all an opportunity to re-evaluate our personal progress with fresh eyes and new clarity. In order to step into our full power and realize our true potential, we must release old emotional baggage from the past six months. There is no room for that which doesn't serve you, when entering a new phase in life. The Sage Moon reminds us to keep our thoughts and energy clear of negativity. Purify your energy often, cleanse your space and aura in order to make room for new growth!! 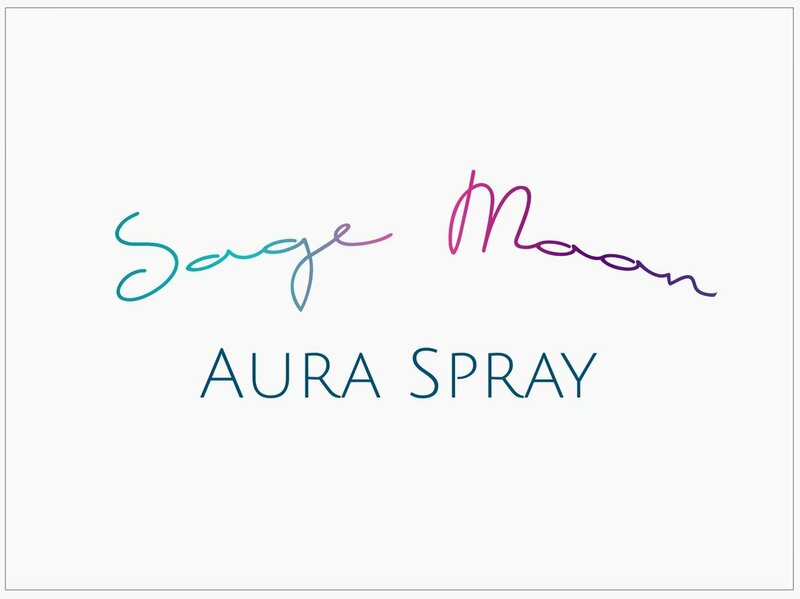 For tonight's Full Moon, we wanted to make an aura and space cleansing spray, infused with the Full Moon Eclipse Energy. This powerful little bottle will clear your aura from negativity in only a few sprays. Because it is smokeless, it can be used to cleanse the energy of cars, the work place and offices. This spray can be used in place of smudging with smoke. This little bottle will be both powerful and easy to make using essential oils, salt, and other ingredients you may already have! 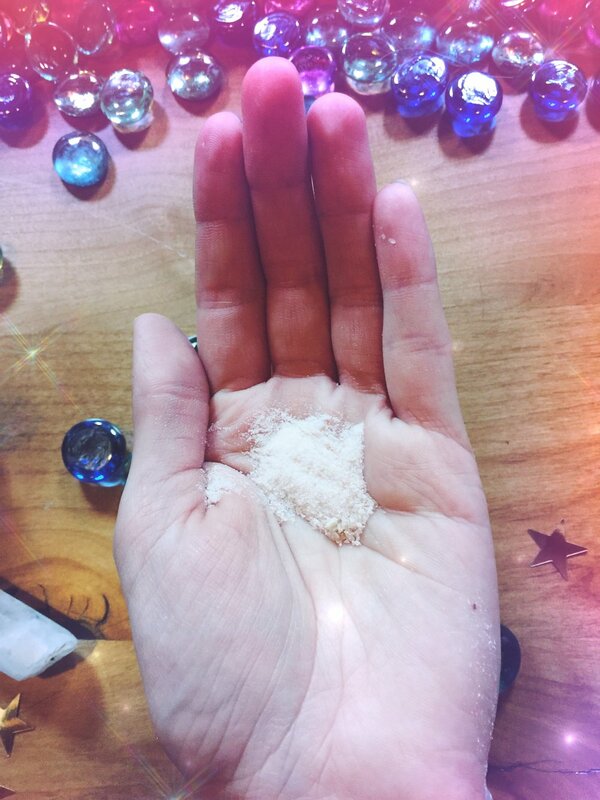 On the night of the full moon gather your ingredients..
Add a pinch of salt to your bottle. Salt is a natural energy purifier and helps ground the energetic body. It brings our energy back to a 0 and creates a fresh clean slate for us. Add your drops of oil. For tonight's spray, we used Sage essential Oil for purity, clarity and ease of thought, with Fir needle for . You can use this guide here to decide which oils you want to use. We recommend definitely using at least some sage for this spray!, as it's the perfect purifier for this energy. Add the water. Water is a powerful conductor and transfers and shifts energy quickly. It's best to use warm water to fully dissolve the salt and mix the oil together. You can add small crystals to your bottle, or set up a grid around your spray tonight and charge it under the Full Moon Eclipse. Give it a good shake before each use. Spray all around your body to cleanse the aura. The healing spray will clear negative energy in the home as well. Be sure to spray into doorways and windows and other high traffic ares, as well as your own aura! Create a label for your bottle, or download and print off our idea by clicking here! You can make several different blends to help shift the energy of your home and space. This cleansing spray can act as a natural perfume while keeping your aura and energy field purified and fresh. We are so excited to be getting the deck back in stock this coming March! We appreciate everyone's patience as we all wait with anticipation! There won't be any changes to the deck, they will still include the silver on the backs and come in the beautiful keepsake box. We are having a sale on the calendars right now! And will soon be offering the black velvet bags to keep the decks in. Be sure to sign up for our newsletter to stay tuned for our updates! Sign up to receive news and updates about when the deck will be back! Our calendars are currently on sale! We are offering the Zodiac Calendar for only $15! Winter nights are thawing into crisp cool dawns... and the spring is beckoning you towards the light. It is time to let your Spirit rise and expand outward. What lessons have you learned from within? What messages and lessons do you bring back from your underworld? 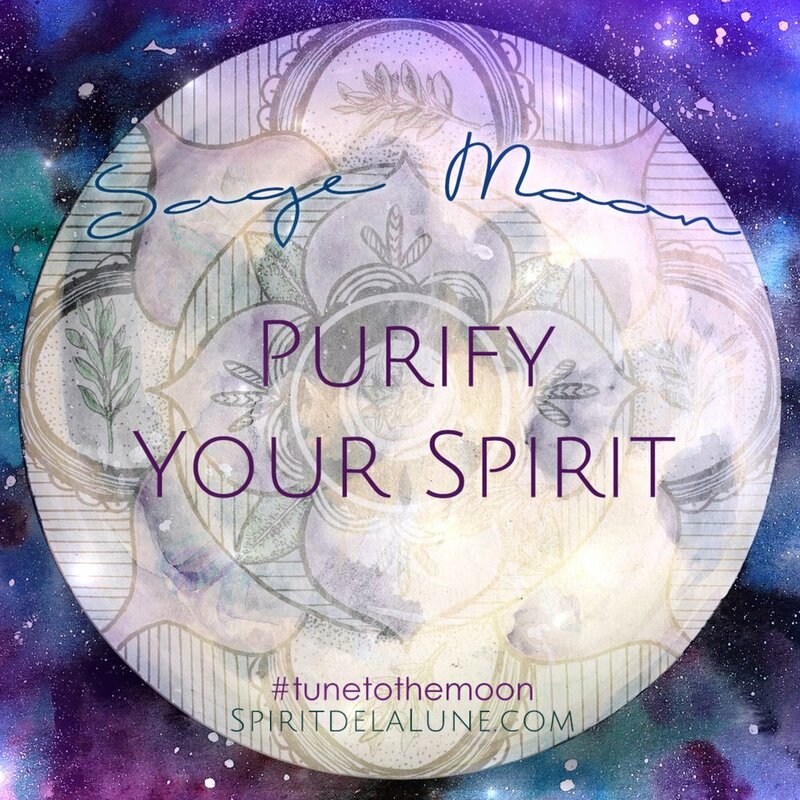 This full moon is ushering in the coming spring, and with it, the need for purification. With every new beginning, there is a need to clear out old, residual, negative and stagnant energy. As you prepare for the new chapter of spring, take time to really release what no longer serves your spirit. This ritual will help you strip away the deep layers of your heavy soul, clean up stagnant energy from your body and home, and help release energy that no longer serves. Sage has been used throughout history by many cultures. From healing wounds and headaches, to purifying energy and opening intuition, it's no wonder wise ones and healers are referred to as "Sages." One of the most common methods of purifying with sage is burning it, or "smudging." Smudging has been practiced for thousands of years and has many benefits. It not only uplifts and clears energy, but it can also purify and improve air quality according to this study by GreenMedInfo. There are several varieties of sage, and many different ways to burn it. For this ritual it is recommended to burn White Sage. If your home is cluttered or messy, take some extra time to clean it and nourish your space. This ritual works best when the home is clean and the energy is able to flow and move about. Move some furniture around to shake up the energy. Take a moment to center yourself. Take some deep breaths and allow yourself to become weightless in the present moment. State your intention out loud and hold it in your heart space. Light some sage and allow the smoke to rise, letting your troubles float away into the infinite abyss. Now is a good time to turn on some music or beat a drum. Stagnant energy needs lots of movement, and the vibrations of a good beat are a great way to shake up energy up and get things moving. A good shake of the hips and some dancing is also great way to clear out old energy in the body and the lower chakras. Get things moving, loosen up and have some fun! Use the abalone shell to catch ashes as your sage burns, and the feather fan to direct the smoke into the nooks and crannies of your home. You can chant, drum and dance as you clear each room. Shake things up! Beat on your pillows and shake out your rugs. Stomp in the corners, clap your hands and wake up the energy in your home. As you dance from room to room, directing the sacred healing smoke upwards, remember to hold your intention in your heart. Spend extra time in any areas that feel heavy or confined. As you finish each room, sprinkle a bit of the cooled ash over the door frames and windowsills, and leave each room with a sense of reverence and gratitude. When your house feels cleansed and pure, take some time to purify yourself. Spend extra time bathing your hands and feet in the smoke. Breath in to your heart space new possibilities. A purified spirit crafts a purified intent. Once your energy, spirit and space is feeling clear to you turn on some calmer music and allow the smoke to clear. Allow the sage to burn out on it's own or put the sage out using your shell.